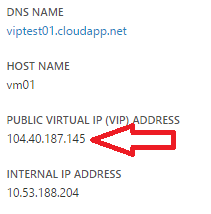 You can see that VM vm01 in my cloud service viptest01.cloudapp.net has a dynamic VIP address of 104.47.161.70 in the West Europe datacenter. If I shut down this VM in the portal (which will de-allocate my resources) and re-start it, the VIP address will be different. Specifically in enterprise scenarios where customers access cloud resources through corporate firewalls, having durable IP addresses for VMs is a common requirement, so let’s see if we can fix this. 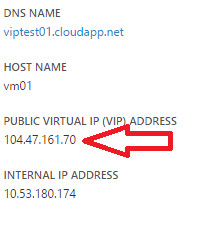 New-AzureReservedIP -ReservedIPName "vip01" -Location "West Europe" -ServiceName "viptest01"
By using the new -ServiceName attribute Azure knows magically that you do not only ask for a new reserved IP, but you also want to use the current VIP of the specified service. 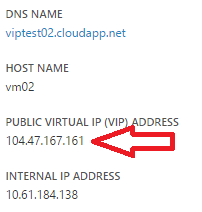 Again, the ServiceName attribute indicates the association with the viptest01 cloud service deployment. You can now safely shutdown and re-provision this VM, and it will reliably keep the same public IP address 104.47.161.70. Remove-AzureReservedIPAssociation -ReservedIPName "vip01" -ServiceName "viptest01"
Set-AzureReservedIPAssociation -ReservedIPName "vip01" -ServiceName "viptest02"
What the Azure fabric will do is switch the public VIP address of the viptest02 cloud service to our reserved IP address of 104.47.161.70 as you can see below. 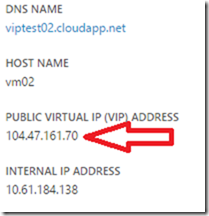 Note that moving the reserved IP address to a different deployment does only work within the same datacenter, as IP ranges in Azure are location-specific. This new capability is very helpful in scenarios where you need to “move” IP addresses between different deployments, i.e. exchange the implementation of a service or provide a failover type of behavior. Reusing existing IP addresses of deployments and not having to re-deploy is a major improvement and saves lots of time. 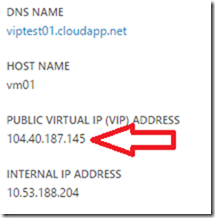 Reserved IP addresses can be used with both IaaS VMs as well as PaaS web/worker roles. Association of reserved IPs with PaaS cloud services can also be done via service configuration files (CSCFG). 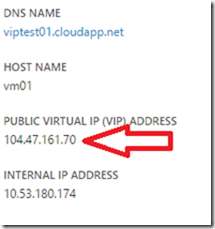 Reserving IPs and converting IPs from dynamic to reserved does not only work for public VIPs, but also for instance-level public IP addresses (PIPs) in Azure. This entry was posted in Microsoft Azure, Virtual Networks and tagged Azure, Microsoft Azure, PIP, Reserved IP, VIP, Virtual Network. Looks like you are the first to cover this long-awaited feature! Any suggestions on what I may be missing? Not sure what’s going on. Is the error message giving more specific details? Maybe try another region. rent than the region europewest that hosted service *snip* belongs to, they need to belong to the same region. Thanks for the good write-up. 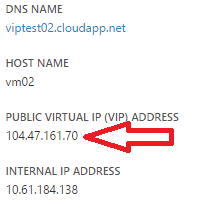 Can I somehow in the portal see that a cloudservice/vm is using a reserved IP ? You can see it in the new preview portal, but not in the current production portal. I opened a support case, and we tested various scenarios, and their conclusion was that the -ServiceName option is too good to be true: it does not work on some older systems. Which sort of defies the purpose, because if we had it set up in the last year or so, reservation would already have been possible at setup time. New-AzureReservedIP : BadRequest : Cannot reserve the ip of deployment viptest02. It does not seem to be specific to a region. We are experiencing this on both US East and US West, where the command works fine on newly created services (but not on existing ones). Did someone had news on when is this going to be solved? Hi _suspect_ it has something to do with Virtual Networks: If your VM is NOT in a VNET, you can’t reserve it’s IP. Can someone confirm this? Thanks for the awesome post, really useful! Extremely helpful, thank you for this information! Thank you so much for posting this. I have spent about 3 days working on this and finally found your page and finished in minutes. Thanks again. thanks for this information, i am searching a long time to realize this. Great content, great writeup, really helpful. Couldn’t ask for more. Thanks for the great article. One question though, I have multiple virtual IP’s associated with my service (have multiple https sites hosted on VM), how do I convert dynamic VIP to static one? Running New-AzureReservedIP results in “ConflictError: The specified virtualIP address is already reserved and associated….”. This is a great topic! I have been wanting to do this for a long time and did not realise how easy it is with the new cmdlets! It did take some time to realise which ones I had to import into Powershell as I am not a huge powershell user, but once this was done, the rest was easy. Could it be an issue with the age of teh cloud service that contains the VM instance I do want to change? I ran this last night on a new instance and was able to reserved the named instance IP no problem at all. One of the reasons you may see this error is if you have not selected the correct Azure Subscription. Check this if you have multiple Azure Subscriptions by doing a “Get-AzureSubscription” command to see all subscriptions and then a “Select-AzureSubscription -name ‘mySubscriptionName'” to select the one containing the cloud service or VM to which you wish to assign the reserved IP.